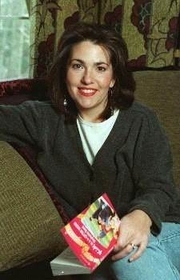 Stephanie Bond Hauck writes as Stephanie Bond and also wrote as Stephanie Bancroft. Stephanie Bond grew up in the small town of Olive Hill, eastern Kentucky, on a tobacco farm with one brother and one sister. She attended Morehead State University on an academic scholarship and studied computer programming. During these years, she bought a shoe store, and she ran the business with the help of her mother. She graduated MSU in 1987, she sold her retail business and started to work in a Fortune 100 petroleum company. She was seven years deep into a computer career and pursuing a master’s degree at night when an instructor remarked she had a flair for writing and encouraged her to submit to academic journals. Once the seed was planted, however, she immediately turned to creating romance fiction in her spare time. "I never saw myself as a comedy writer, until a Harlequin editor asked if I could write comedy. I lied and said not only did I write comedy, but I had a great idea for a book she might be interested in, and shot her an idea from the top of my head. When she said she liked it, I told her I had three chapters finished to send her right away. Then I went home and wrote like a madwoman. That book was my first Harlequin comedy, Irresistible." Harlequin purchased Irresistible from Stephanie in the fall of 1995 for their Love and Laughter line. In another two years, she left her computer career to write full-time. As Stephanie Bond and Stephanie Bancroft, she has written over 60 novels for different publishers. She is best known for writing steamy books that make readers laugh out loud. Stephanie Bond is currently considered a "single author." If one or more works are by a distinct, homonymous authors, go ahead and split the author. Stephanie Bond is composed of 5 names. You can examine and separate out names.